Dan. A. Rudd (Daniel Arthur), b. 1854 and Theo. Bond, b. 1879. From Slavery to Wealth. The Life of Scott Bond. The Rewards of Honesty, Industry, Economy and Perseverance. From Slavery to Wealth. The Life of Scott Bond. The Rewards of Honesty, Industry, Economy and Perseverance. Madison, Ark. : The Journal printing company, 1917. 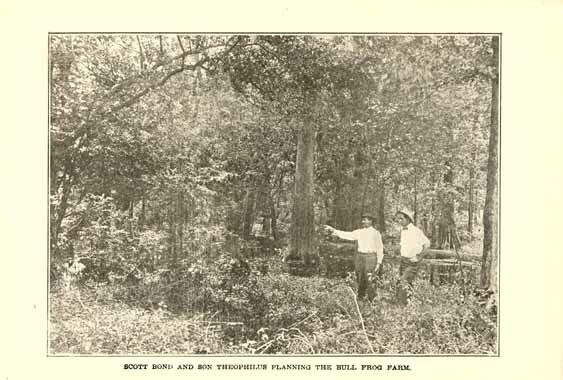 SCOTT BOND AND SON THEOPHILUS PLANNING THE BULL FROG FARM.